This page introduces the thing made from WonderSwan Personal Software Development Kit "WonderWitch". WonderCommand (Japanese) IR Remote Control Transmitter for MindStorms using WonderSwan(WonderWitch). 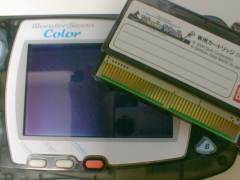 WonTouch (Japanese) Touch panel for WonderSwan(WonderWitch)!